The essence of natural garden pest control is to make life hard for garden pests, while making life easy for their natural enemies, your garden allies. Habitat control is the key. Reduce or scatter the habitat of garden pests. Enhance the habitat for garden allies. Follow these rules, and garden pests will rarely get out of hand. 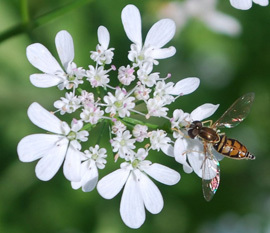 The goal of natural garden pest control is not to eliminate garden pests, but to keep their numbers low. 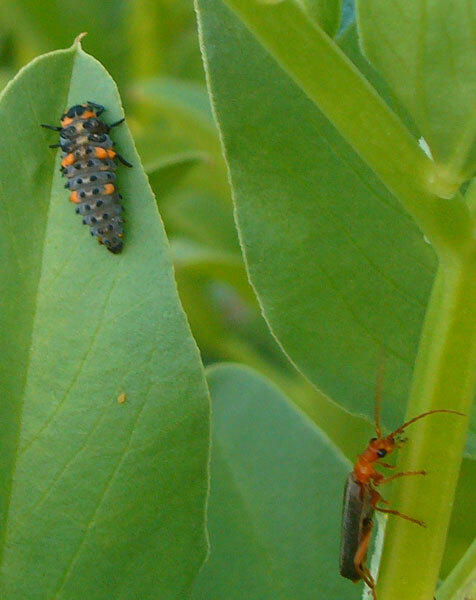 After all, garden pests are the food—and hosts—of garden allies. See Beneficial Garden Insects for more information. In a functional organic garden, you’ll find many different kinds of insects—just not many of any one kind. Pesticides, fungicides, and herbicides simplify ecosystems—exactly the opposite effect you want in an organic garden. 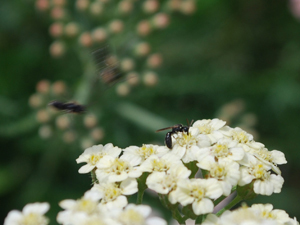 Natural garden pest control relies on biodiversity to control garden pests. I’ve seen so many beginning gardeners panic at the first sign of aphids. They immediately go out and buy a tub of ladybugs from the local garden center. They release them in their garden, snickering and rubbing their hands together gleefully, and the next day, not a single ladybug remains. Most of the aphids are still there. Why did all the ladybugs fly away, with so much food around? Well, they’ve been in a box for a week or two, crawling all over each other. They have food of sorts in the tub, so they’re not that hungry. As soon as that box lid opens, they’re looking for new digs, not lunch. Ladybugs and other garden predators love lacey, feathery foliage. If you release them in your garden and you have carrots, cilantro, fennel, dill, cosmos, or yarrow growing, they’re more likely to stick around. But if you have these plants growing in your garden, you’ll never need to buy ladybugs. What if you don’t have a garden? What if you’re growing vegetables in containers on an apartment balcony? 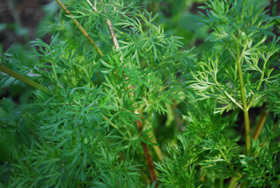 Natural garden pest control strategies work for container gardens as well as they do in the field. I live on a second floor apartment in a city, and grow salads in window boxes. I have to rescue lady bug larvae floating in the salad rinse water. Syrphid flies and tiny parasitoid wasps patrol the spinach and lettuce plants in my window boxes. Attracting Beneficial Insects describes ways to attract, sustain, and build up populations of beneficial garden insects year to year.